Looks like you're gonna be up late! magicfish, if you're willing to share, I'd be interested in your method for tackling the material in these books. Do you pick one, flip to a random page and read, or is it something else? Like Dan, I'm curious. It's neat to see photo spreads of good books, but as far as actually studying, at least as I do it, I can't imagine wanting to sit down with more than one volume at a time. How does this work? Also, am I alone in being troubled by what looks to be a drinking glass sitting directly on a close-up mat? I'll bet you had fun, Magicfish! With the Nick Trost books ... like Harry's books ... I go thru them trick by trick; deck in hand. I'll read through the trick once and if I like it, try it out with the cards in hand. Of not, or if I think think I've read dozens of similar tricks, I'll move to the next. Good question DJ, but keep in mind I have already been through all of these books (and all of my books) cover to cover with cards in hand and already made my decisions about the material. However, one of my very favourite ways to spend my time is grabbing some volumes off my shelf, and rehashing the material. Some effects that I used to do will come back to me. Some effects I previously discarded will suddenly appeal to me. I will rediscover bits of wisdom and whimsy. Fresh eyes if you will. I love to sit down with many volumes. I love the contrasts in style and structure of the books themselves as well as their content. Reading the words of a good author is like listening to their voice. Like having them there with you- instructing you. When I put one down and pick up another, it's like the discussion is switching from one participant to the next. Last night I had a card session with Lorayne, Trost, Bannon, and Marlo. Not a fan of the Trost book Barry? Thanks for sharing magicfish, I appreciate it. I had it many years back (mid 90's?) when it was first released by L&L. He's a creative thinker; and it seemed to be an encyclopedia of his life's work. I don't remember ever using anything from it though. In fact, I know I didn't. I'm not really into many packet effects (unless you are using a few cards from the deck you are using - such as Harry Lorayne's Ace Monte) and I've never really liked using trick or gaffed cards, fake/gaffed decks, etc. However, to be honest, I do sometimes use one effect with a Blank Deck. Was there also a section with ESP cards? I have to admit that I've always been the same - as soon as I see anything with circles and wavy lines, my eyes glaze over. My loss I guess. 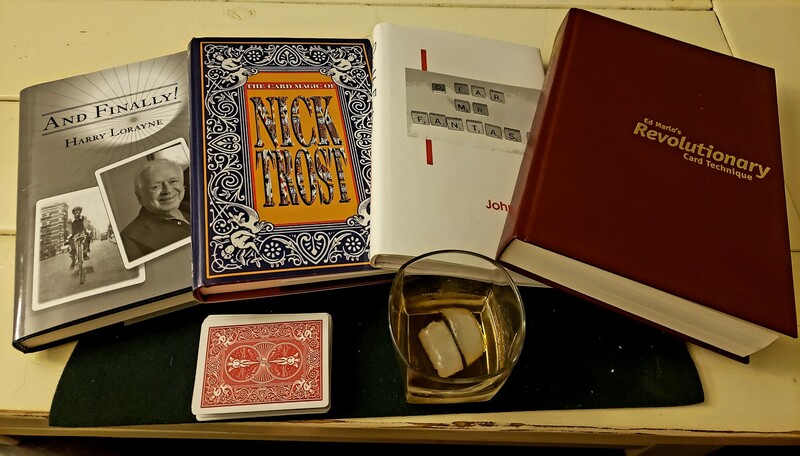 To be fair, I bought the Nick Trost book during a period when I bought a lot of books - primarily cards. Therefore, along with other titles, I admittedly probably never gave it sufficient study. I must be a philistine as I bought this around the same time as Bro. Hamman's book - and I remember thinking that was utter cobblers too. That said, Richard Kaufman's 'flowy-style' of illustration turns me off more than a packet of ESP cards. Card book-wise, the stuff that floats my boat has just always been commercial material with a regular deck; that you can go straight into; doesn't require you to be seated (or can be suitably adapted for standing) - and needs you to cull around 5 cards max. 2 authors spring to mind - they're all I now have on my shelf. Interesting regarding the Nick Trost book. Much of Trost’s material requires fairly involved setups. But I like it and will keep it. I bought it from the original Magic Books By Post in 1997 at the British Convention Southport. For me, the final section is the most useful. It covers popular used basic card moves. The descriptions are brief, but practical and there are some source references for credits. The follow-up books, "Subtle Card Creations," volumes one and onwards are an exercise in diminishing returns. I’m something of a barbarian myself, because in regard to Hamman, Elmsley, and Complete Walton, in general, I agree. "...and it is my contention that , but for Dai Vernon’s advocacy, The Expert At The Card Table would never have achieved its undeserved reputation." Time now to reach for the hard hat and head for the barricades. The last time I agreed to help someone learn magic, the gentleman insisted that he was going to start with Erdnase. I told him this was a huge mistake but he would not listen. A year later he could not perform even the simplest of sleights (false shuffle, for example) and rejected all of my advice since "that's not what Erdnase says". We are no longer in communication. Regarding Tony Giorgio, if I remember correctly his objection to Erdnase was that he did not believe Erdnase had any authority to write about viable gambling artifice. I wouldn't know about that - but I certainly feel it is not a good choice to start an education in card handling for magicians. Who can argue with the 1st point - without Vernon The Expert At The Card Table would probably never have received anywhere near the notoriety that it did. Georgio's column was basically him saying outrageous stuff to get attention. Personally, I found it quite boring. That was certainly one of his grievances. At times I think that clouded his judgement and got in the way of an objective overview of the actual material. So Erdnase wasn’t a gambler (perhaps) but so what. Neither were Scarne and Vernon. Regarding "outrageous stuff". Not all the time, I’m sure, but given that, most columnists are blowing their own trombone. Not unlike Magic Forumites??!! I thought his stuff was interesting but he did tend to play the same licks a few too many times. For me anyway. Without the glass, think what a mess the liquid and the ice would make. However, I also enjoy reading Dai Vernon material (albeit more so the Lewis Ganson authored works).